I love to buy shoes, especially flat shoes nowadays. However, when I was in my early 20s I only wore high heels, which were between 8cm (3″) to 10cm (4″). I wore heels every day, all day except when I was working out. At that time, I still could. While I still love my high heels, I prefer to wear flat shoes today. They’re so comfy and I’ve gotten used to wearing comfortable shoes. Even though I don’t wear high heels as often, I still buy them when I find a gorgeous pair. I know I probably won’t wear them often but I can’t help it. Am I the only one? 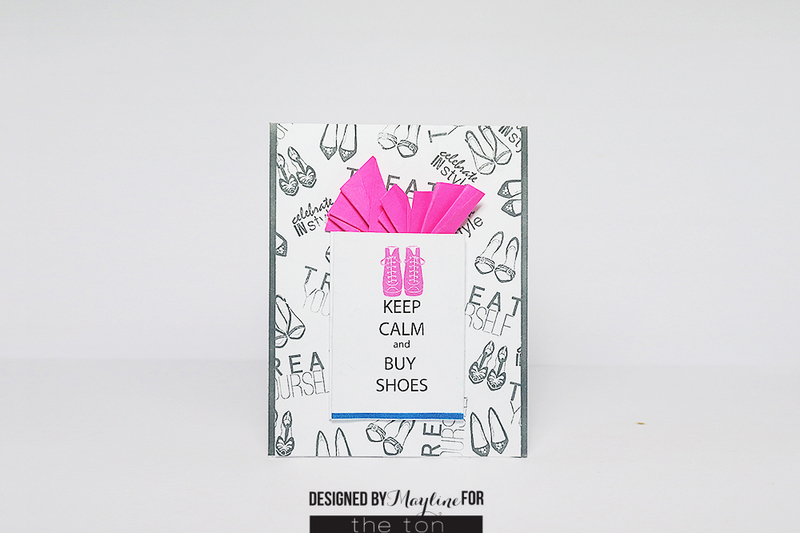 When I made this card, I thought about buying shoes. So I created a shopping bag in the center of the card. The folded pink paper represents colored tissue paper for decorating inside the bag. Does it look like real tissue paper? I wanted to use real tissue paper but I didn’t have any on hand. For the this card, I only used the Shoe Wardrobe Filled set. Here is a close-up of my card for today! I hope you like my card and are inspired by it to create something similar! I’ll see you next week!